The material data safety sheet for flouride lists it as a poison and in addition, it states that “repeated or prolonged exposure to the substance can produce target organs damage.” All toothpastes containing flouride list the following warning on the back of the tube: “If more than is used for brushing is accidentally swallowed, get medical help or dial (412)390-3381 right away (Poison Control Center. Ingestion of flouride is cumulative. So what’s next for our oral health experts on the BOS, recommend small amounts of arsenic in our water because it’s good for us. If they wish to “save” the lower income people with bad teeth distribute flouride tablets to them. It’s shocking that the left wing Supervisors would support putting poison in the water. The foolishness of fluoridating everyone’s entire bodies in order to strengthen the tooth enamel of children is staggering. Fluoride is in most toothpaste as everyone knows. The problem is bad oral hygiene and sugar eating among children. Sonoma County schools have been flooded with both legal and illegal immigrants that are predominately from low income families. The increase in dental problems can be directly linked to this shift in demographics. Addressing the problem by adding poison to everyone’s water is not the answer. What’s wrong with our Supervisors that they can’t see what’s going on here? Big corporate interests will be the beneficiaries of this because they will be able to sell their wastes instead of paying to dispose of them. I’m ashamed of our Supervisors for supporting the corporatocracy instead of their constituants health. Why not just give toothbrushes and toothpaste to every low income kid in Sonoma County? Stop punishing the rest of us for our government’s lax immigration policies that are contributing to our societal ills on many fronts. Maybe we should vote out any Supervisor that votes to put toxic fluoride in our water. This is the reason I have stopped giving money to Cancer Cure Research programs. Our Supervisors only want to continue causing cancer!!! I believe there are cures for cancer, however there is a whole industry depending on it for their income and livlihood…at our expense! Find all of the CAUSES of cancer and STOP them now! Flouride is one of them. I already use filtered water in my house because of the chlorine that you can SMELL coming out of the tap! I know exactly when the water has been treated. NO FLOURIDATION!!!! VOTE OUT THESE SUPERVISORS WHO MAKE DECISIONS WITH THEIR FEELINGS INSTEAD OF THEIR KNOWLEDGE AND SCIENTIFIC EVIDENCE! EDUCATE FAMILIES ON PROPER DIET AND DENTAL CARE. Studies have shown that the rates of tooth decay are the SAME in fluoridated and non-fluoridated areas (http://www.fluoridealert.org/health/teeth/caries/nidr-dmft.html). Fluoride’s effects are topcial, not systemic. There is literally NO reasonable justification for putting fluoride in the water. It increases bone cancer rates, it lowers IQ, and over a third of children in this country are suffering from dental fluorosis according to the CDC. Fluorosis is fluoride poisoning. 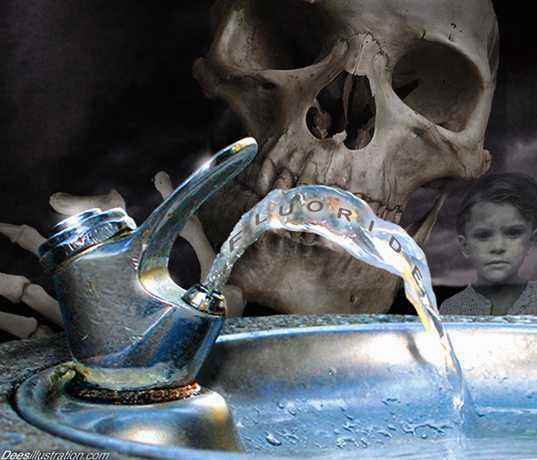 The fluoride added to water supplies is literally crude toxic waste. The aluminum and fertilizer industries are happy to dump this crap in our water, since it saves them the tremendous cost of having the toxic waste neutralized. Unfortunately for us, it is contaminated with heavy metals. All you need to know about Flouride. For those who don’t know this is ALL tied to Agenda 21! At least with Smart Meters we could “opt out”! “The Case Against Fluoride How Hazardous Waste Ended Up in Our Drinking Water and the Bad Science and Powerful Politics That Keep it There,” Paul Connett, PhD, James Beck, MD, Phd, H S Micklem, DPhil (2010), should be required reading for anyone endorsing the addition of a toxic chemical, and by-product of pesticide production, to our drinking water. The book is well written, fact based and broadly sourced. I believe adding fluoride to our water needs to stop. Don’t rely on outdated studies or old unsupported claims that fluoride is safe. Investigate and become knowledgeable, fluoride is not the savior you may think it is.